In a TEOTWAWKI situation, you may find yourself scavenging in homes that have been locked up and deserted. However, if the windows are boarded up or you are trying to enter an apartment, the only way to get in may be to break the door down. 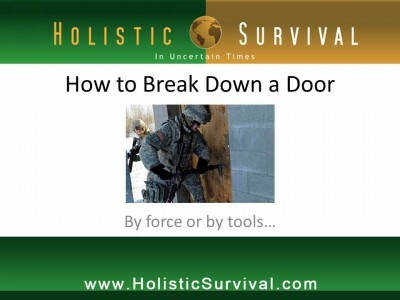 This guide will teach you the easiest way to knock down doors. Interior doors will inevitably be easier to knock down than exterior ones, which are often solid wood and built for security. Slamming a door with your shoulder may work for knocking in interior doors; however, not only can you get injured, there is an easier way. A door is held shut by the mechanism on the handle or knob, but it is secured by a separate lock or deadbolt. Use your foot to kick the door directly on the lock. Your foot offers more force than your shoulder could and you will have an easier time directing the hit. Sturdier locks may require several kicks before the lock gives way. If you’ve packed a screwdriver in your jump bag, you can use it to gain entry to buildings which only have privacy locks, which are the locks in a door knob, not deadbolts. Privacy locks have an emergency access hole on the opposite side of the lock, which when triggered, free the lock. Simply insert the screwdriver into the hole. In a pinch, you can use any long, thin, sturdy object, like a wire coat hanger. Some locks require you to turn the screwdriver, while others just need to be pushed, so probe around and experiment until the lock gives. For exterior doors, a little more is needed to gain entrance using tools. If you have a pry bar or a flat sturdy piece of metal, you can simply jam it into the space between the lock and the frame and force the door open. Or if have a screwdriver and a hammer, you can work around the lock by removing the hinges and simply lifting the door from its frame. Place the tip of the screwdriver under the bolt in the hinge and use the hammer to hit the handle of the screwdriver. It’ll act as a lever to wrest the bolt from the hinge, freeing it from the frame.